In a match completed in a speedy 52 minutes, Johanna Konta won 12 straight games en route to a 6-1, 6-0 first round victory over sixth-seeded Serena Williams Tuesday night at the Mubadala Silicon Valley Classic. A stark contrast to the nearly three hour marathon played under the lights Monday night between Victoria Azarenka and Kateryna Bondarenko, Tuesday evening’s feature match took about a third as long to wrap up. Konta, who lost to Williams at the 2017 Australian Open in their only other meeting, dropped the opening game of the match and then won 12 straight to capture the win. The serve was a strong point, collecting six aces and a first serve percentage of 64%. Williams struggled from the service line, committing seven double faults and unable to break 40% with her first serve. With a quick match comes a quick turn-around for Konta, who will be back in action again tomorrow afternoon against 19-year-old American Sofia Kenin in second round action. Other matches on Day 2 saw a pair of three set singles matches as Heather Watson battled to beat Claire Liu 6-4, 3-6, 6-4, while the fifth seed Mihaela Buzarnescu was taken the distance by Sachia Vickery 6-3, 4-6, 6-3. Timea Babos, the tournament’s number eight seed, defeated her doubles partner Kristina Mladenovic 6-4, 6-2, while Vera Lapko advanced to the second round with a 7-6, 6-0 win over Shuai Zhang. In the last match of the night, American Amanda Anisimova, the tournament’s youngest competitor at just 16 years old, won in straight sets over Qiang Wang 6-2, 7-5. Anisimova will play Buzarnescu on Thursday, Babos will face Maria Sakkari on Thursday as well, while Lapko will be back in action tomorrow against Danielle Collins. All three doubles matches played on Day 2 were decided in straight sets. 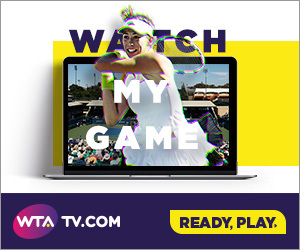 Sofia Kenin and Aryna Sabalenka defeated Irina Falconi and Veronica Cepede Royg 6-4, 6-1, Priscilla Hon and Georgina Garcia Perez winners against Kateryna Bondarenko and Valeria Savinykh 6-4, 6-4, and the pair of Anna Blinkova and Natela Dzalamidze moving on with a 6-3, 6-3 win over Maria Irigoyen and Desirae Krawczyk.